Welcome to Carlisle Fairtrade’s website. Here you can search where to eat, drink and stay Fairtrade in Carlisle. 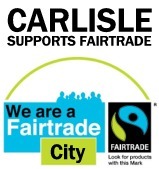 Visit the NEWS page to keep up to date on Fairtrade activities in Carlisle.